The curious death of Initiative 1631 and what it says about the future of addressing climate change. Early on election night, as a drizzly dusk settled over Seattle, I made my way to the Arctic Club, a hotel decorated with explorers’ maps and a fake polar bear—a fitting place to await the results on Washington’s carbon tax initiative. Upstairs, in a dimly lit ballroom, community organizers and other supporters of the ballot measure had already gathered. Recent polls suggested a close call on the measure, officially called Initiative 1631, a local, political effort to address the global challenge of climate change. 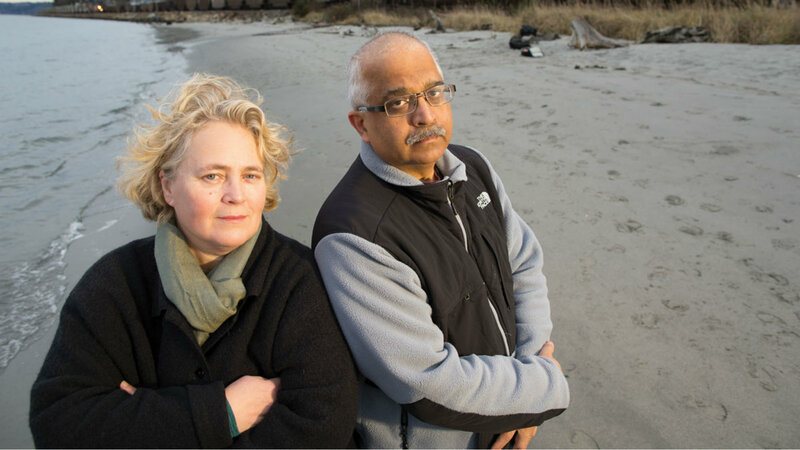 The failure of Washington’s carbon tax proved a dim coda to the state’s long fight to control rising temperatures and reverse their effects on its most vulnerable communities. Its demise raised big questions about humanity’s ability to address climate change. Yet its failure had seemed improbable. After all, in the months leading up to the vote, climate change made its mark on much of Washington life. Over the summer, a ragged line of wildfires scorched the Northwest, curling from British Columbia through eastern Washington and down to Oregon. Wheat fields and forests burned and towns throughout the region were choked with wildfire smoke. In Seattle, people halted their daily runs and commuters wore masks to work, as an orange murk hid the hills of the suburbs and clung to the Space Needle. In August, a mother orca lost her calf, then carried its body on her nose for 17 days, a painful reminder of species loss and habitat degradation. In the fall, many of the state’s largest salmon and steelhead fisheries closed, from the Yakima to the Columbia River, thanks to warming rivers and oceans. Just a few weeks after the election, the National Climate Assessment confirmed that all that was likely just an ominous portent of things to come: Climate change threatens the region’s infrastructure with landslides, rising seas and aberrant weather, while its most vulnerable communities face deteriorating air and water quality. Given these reminders, now would have seemed a prime time for Initiative 1631. For years, economists have said that a carbon tax—which essentially builds an economic incentive to curtail emissions of carbon dioxide—is one of the most efficient ways to combat climate change. Initiative 1631 proposed to do this by putting a fee ($15 per metric ton) on carbon emissions from the largest polluters, then slowly increasing that fee, with the revenue going toward programs that reduce greenhouse gases and pollution and their effects. Washington voters, in other words, were given a specific action to undertake while they lived out the specific consequences of climate change. Washington voters were given a specific action to undertake while they lived out the specific consequences of climate change. 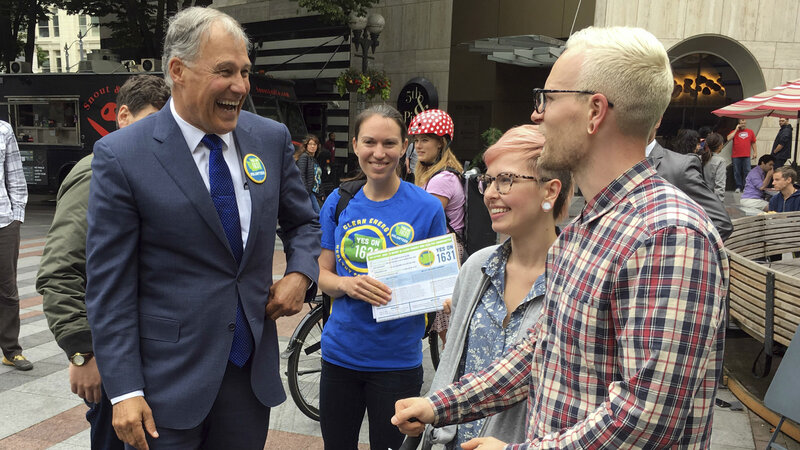 In the past decade, the Northwest has seen a slew of wins in fights against carbon-emitting infrastructure—and a slew of losses on climate policy. KC Golden is a longtime climate campaigner and, until recently, a senior policy advisor at Climate Solutions, which helped craft Initiative 1631. Now almost 60, Golden claimed his first climate victory in the 1980s, when his group Northwest Energy Coalition was part of regional energy efficiency efforts. In those days, Golden was fighting the “greenhouse effect,” an early name for the warming effects of carbon dioxide, and he won support by pointing to both reduced energy costs and environmental benefits. By 2008, Golden had helped craft local and state commitments to clean energy, and climate activists stepped back, thinking their local fight was mostly over and the federal government would pick up the slack. President Barack Obama’s White House seemed committed, along with much of the world, to reducing emissions of greenhouse gases through regulations and other incentives, with states like Washington, Oregon and California poised to help lead the way. By 2010, the decline of the US coal market had become obvious, and the fossil fuel industry began to eye the West Coast for access to Asian markets. “They were holed up in the mountains with their coal, and they were trying to figure out where to go,” Golden said. The West Coast offered the quickest way from coal country to China, and so began a wave of proposals for trains to haul the coal and for coastal terminals from Oakland, California, to Bellingham, Washington, to export it. The natural gas industry also began to swell, proposing a dozen separate refineries and terminals with their attendant pipelines and trains in Oregon and Washington. The simplest explanation is that people just don’t like taxes, and oil and gas outspent green groups to exploit that dislike. In Washington, fossil fuel companies and lobbyists spent more than $30 million to defeat Initiative 1631, versus $17 million from supporters. The solution, then, would seem to be to convince people they’ll be just as well off before a carbon tax as after—and to match fossil fuel interests’ spending dollar for dollar. But some observers say the challenges with raising taxes to pay for climate action run deeper. Initiative 1631’s demise might have had something to do with moments like this, where the connection between taxing carbon and more immediate fears about one’s health or one’s job becomes obscured. The initiative promised to pool funds for projects, including new bus lines, land conservation grants, and training to transition fossil fuel workers into other jobs. But when people need to choose between their day-to-day concerns and a future pot of money for projects they can’t imagine, the day-to-day wins. Our minds are better suited to immediate threats—like snarling hyenas or flammable trains—and we struggle with the abstract dangers of a changing climate. Despite the work of scientists and researchers, whose models are getting better at explaining the chaotic relationships between climate and weather, the truth is that the destructiveness of a particular storm is hard to link straight to a changing climate—what experts call “the attribution problem.” Smoky summer days in Idaho can seem far removed from a tax, or fee, that will somehow reduce carbon emissions, somehow slow climate change, and somehow decrease wildfires. In this way, climate change can boggle the imagination. 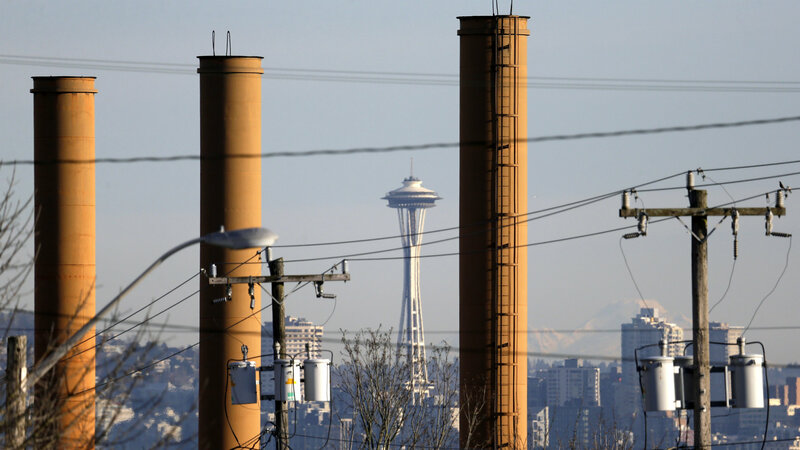 Unsurprisingly, the carbon tax found wide support among the state’s tribal nations, some of whom face the obvious possibility of displacement due to rising seas, and in Seattle’s communities of color, where air pollution already causes higher-than-average rates of asthma. Given this, the fight over what to do about rising temperatures epitomizes all our other disagreements over what justice—let alone climate justice—might, and should, look like. For example, Stevenson, the canvasser, was first drawn to climate activism through her interest in reproductive health and justice: “There are areas where people’s children are not growing up healthy because they’re breathing in fumes or drinking fossil fuels in their water,” she said. She used that argument to talk to her dad about climate change, invoking his sense of familial values and his worry for his kids and grandkids. The fight for the carbon tax, then, becomes a fight for what the future of our society ought to look like—and on that, we remain deeply conflicted. On the other hand, voters—most of whom aren’t economists—tend to prefer energy standards because they put the costs on those most directly responsible for carbon-emitting systems, the real estate developers and car designers. And although the cost of new standards varies between industries, within them, the costs are the same. An engineer at Volvo isn’t likely to compare her efficiency costs to those of double-paned windows in a new high-rise. Rather, she’ll look to her competitor at Peugeot, who is under the same constraints. Without a course correction, climate activists may well find themselves right back where they started, raising the body count on failed climate initiatives while blithely marching forward. In Canada, for example, Prime Minister Justin Trudeau faced blowback for his carbon tax proposal. And not long after the US midterms, France underwent a major political crisis, brought in part by a fuel tax meant to curb emissions. In the US, advocates are crafting an economic stimulus package—a Green New Deal. And there, at least, they seem to have taken the hint: That package sidesteps a carbon tax entirely. What, then, should we take away from the death of 1631? The big lesson is that we need to seek the root cause of our worries, clarify our fears and to face them head on. Golden thinks the first step is to regain a sense that our collective actions can actually affect the course of climate change. On our dependence on fossil fuels, “we’re fighting something that’s dying,” Golden told me. “We’re just not on the same timeline as physics.” Climate change is not just an environmental problem or an economic problem, and it can’t be framed that way. It’s a challenge to our moral imagination—and a big one. Putting a policy to that will be as daunting as it is urgent.